The UI [Unemployment Insurance] program — which is overseen by the U.S. Department of Labor and administered by the states — collects payroll taxes from employers to insure workers against unexpected job loss. Eligible workers who become unemployed through no fault of their own can receive temporary income support while they search for reemployment. In 2016, the program paid $32 billion to 6.2 million out-of-work individuals. UI is one of America’s most important anti-poverty programs for individuals and families, serving as a key counter-cyclical stabilizer for the broader economy. In 2009, the worst year of the Great Recession, the UI program kept 5 million Americans out of poverty, and prevented an estimated 1.4 million foreclosures between 2008 and 2012." So what's wrong with UI as it stands? The system was designed for full-time workers, who have been with an employer for some time, losing full-time jobs. It doesn't do a good job of covering independent contractors, freelancers, short-timers, and part-timers. However, if you are receiving unemployment insurance and you take a freelance or part-time or self-employed job, your benefits usually stop. 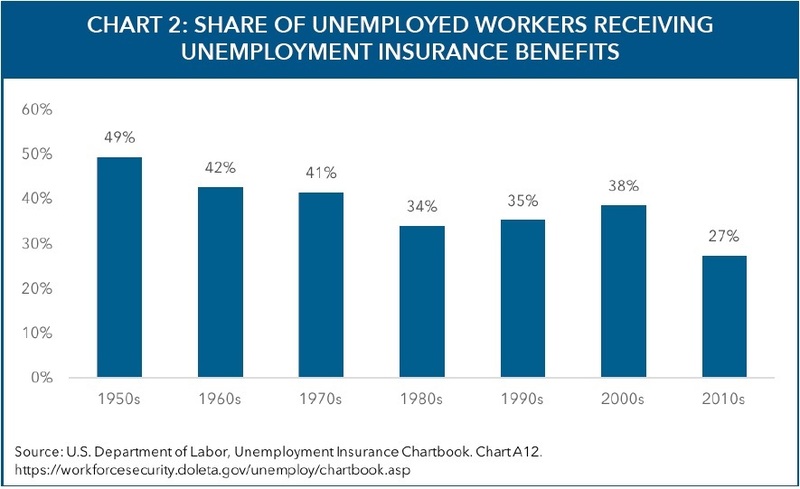 The share of unemployed workers who are actually covered by unemployment insurance is falling over time. Many of the reforms mentioned here have been kicked around before, but it's still useful to have them compiled in one place. The main conceptual difficulty is that unemployment insurance needs someone to pay into the system on a regular basis, but only to withdraw money from the system when it's really needed. Some legislative creativity may be needed here. 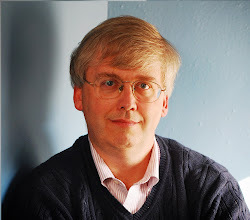 But for example, independent and freelance workers could pay unemployment insurance premiums while employed, and if they did so for some period of time (maybe a year or more), they could become eligible for some level of unemployment insurance payouts. Figure out ways to offer some protection to those who hold multiple jobs, but are not currently eligible for unemployment insurance from any single employer. Figure out how to offer at least some protection to self-employed and temporary workers. Alternatively, nontraditional workers could be allowed to set up tax-free savings accounts that they would only use if they became unemployed. Such an account could be combined with a retirement account: basically, a worker with a short-term financial need could withdraw some money from the account, but only up to a certain maximum--while the rest stayed in the retirement account. Finally, it seems wise not to be too quick to cut off unemployment benefits for those who try to work their way back with a part-time job or by starting their own company. Or unemployment insurance could be designed to encourage workers to conduct a long-distance job search and consider moving to another city or state. The OECD Employment Outlook 2018 that was just published includes a chapter on unemployment insurance issues across high-income countries. 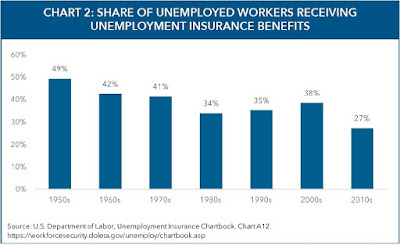 The problem of limited coverage of unemployment insurance is common. "Across 24 OECD countries, fewer than one-in-three unemployed, and fewer than one-in-four jobseekers, receive unemployment benefits on average. Coverage rates for jobseekers are below 15% in Greece, Italy, Poland, Slovak Republic, Slovenia and the United States. Austria, Belgium and Finland show the highest coverage rates in 2016, ranging between approximately 45% and 60%: In countries with the highest coverage in the OECD, at least four-in-ten jobseekers still report not receiving an unemployment benefit." Unemployment insurance systems differ quite a bit across countries: qualifications to receive benefits (like what kind of job you previously had, for how long, and how long you have been unemployed from that job), level of benefits, time limits on benefits, whether you are required to get training or some kind of job search assistance while unemployed--and how all of these factors were adjusted by political systems during and after the rise in unemployment during the Great Recession. "[U]nemployment benefits provide the principal instrument for linking jobless people to employment services and active labour market programmes to improve their job prospects. In the absence of accessible unemployment benefits, it can be difficult to reach out to those facing multiple barriers to employment, who therefore risk being left behind. In these cases, achieving good benefit coverage can be essential to make an activation strategy effective and sustainable. For this reason the new OECD Jobs Strategy calls for clear policy action to extend access to unemployment benefit within a rigorously-enforced `mutual obligation' framework, in which governments have the duty to provide jobseekers with benefits and effective services to enable them to find work and, in turn, beneficiaries have to take active steps to find work or improve their employability ..."